Making risotto is a contemplative process. It’s not difficult; it just takes a certain amount of planning and time. Assemble your ingredients, heat the stock – then just stand at the stove and stir. The basic ingredients for risotto are simple. Rice and hot stock are essential; wine, butter and cheese are usually included too. Other ingredients – seafood, vegetables, spices and so on – will vary according to the recipe. Of all these, the most critically important element is the rice. The best rice for risotto is a short grain, high-starch rice, like the Italian varieties of arborio, carnaroli or vialone nano. They’ve been bred for centuries to produce a rice grain that absorbs liquid (and flavor), yields a deliciously creamy consistency, yet remains firm even after long cooking. Our ramp risotto captures the freshness of spring by using the two parts of the plant – the bulb with stem and the green leafy tops – differently. The pungent bulb, with its distinctive flavor and potent garlicky bite, goes in early in the cooking process. The long, slow simmering tames the sharpness and infuses that unique ramp flavor throughout the risotto. 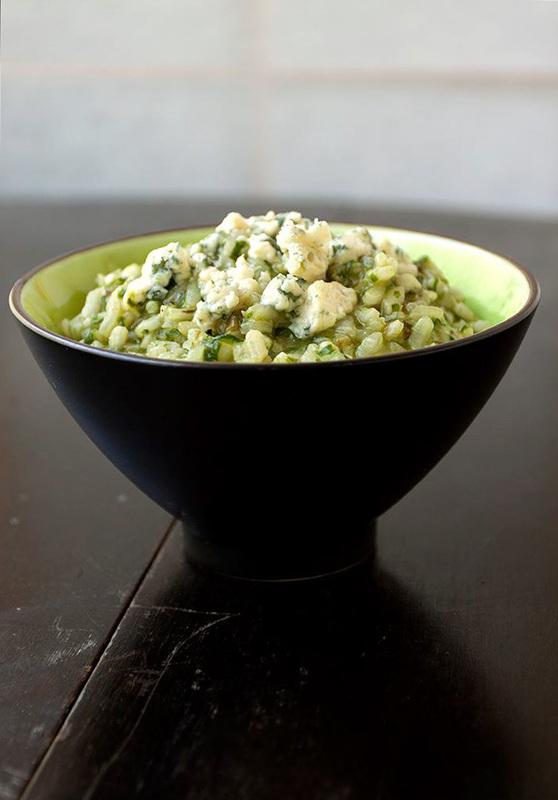 The ramp greens which have previously been blanched and pureed, are stirred in near the end of the cooking process to preserve both their vivid color and fresh flavor. 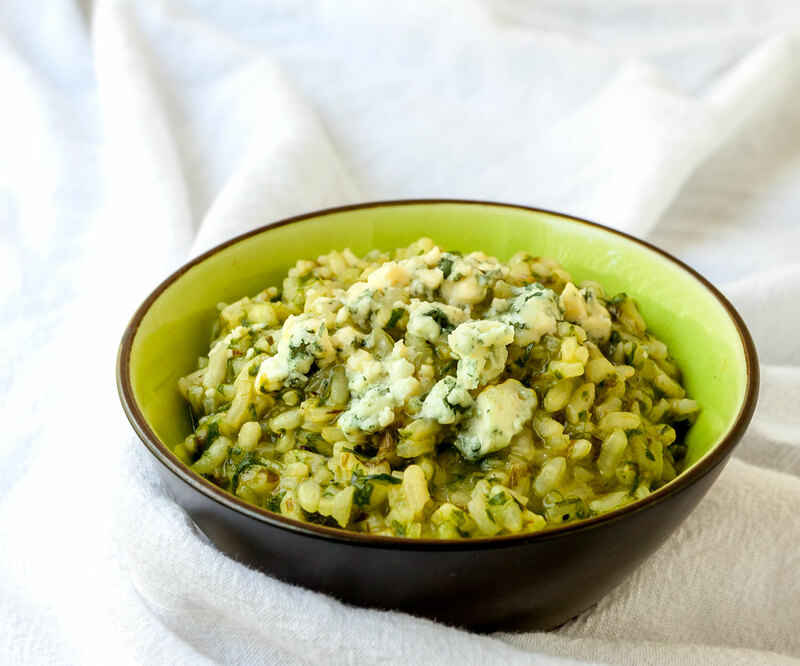 Lastly, a crumble of tangy blue cheese tops the warm risotto – a perfect accent to the rich, earthy flavors of the ramps and creamy texture of the rice. 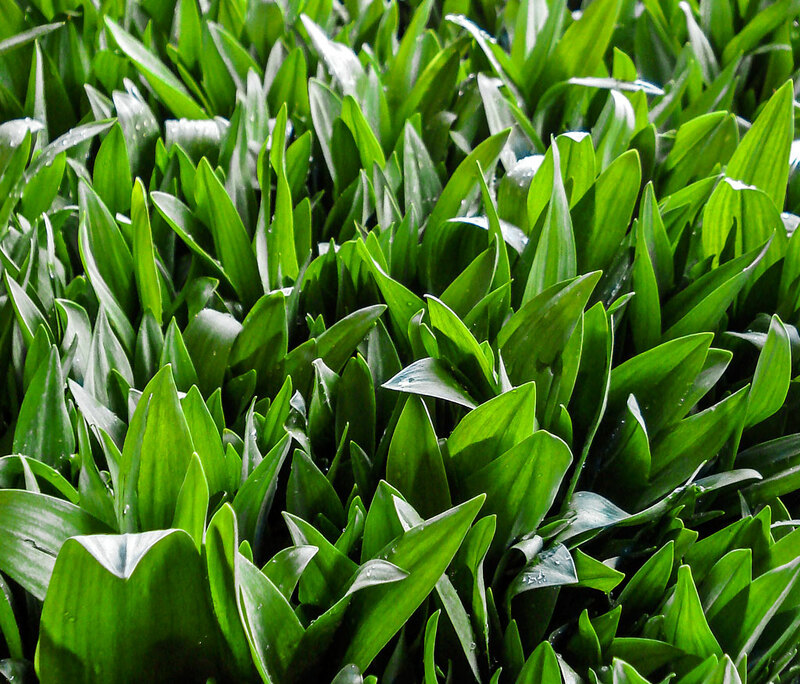 Trim the roots from the ramps and wash them well. Cut off the greens and set aside. Cut the ramp bulbs and stems into 1/8 inch thick slices. Heat a pot of water to boiling. Dip the ramp greens into the boiling water for about 10 seconds to blanch them, then plunge them immediately into a cold water bath. Drain well and pat dry. Squeeze the blanched ramp leaves to release as much liquid as possible. Put the ramp leaves into a food processor and process on high. Slowly pour in a few tablespoons of olive oil until the ramps are whirling freely. Process until fairly smooth. Remove the ramp green puree from the processor and set aside. Heat the butter over moderate heat in a medium sized sauce pan. 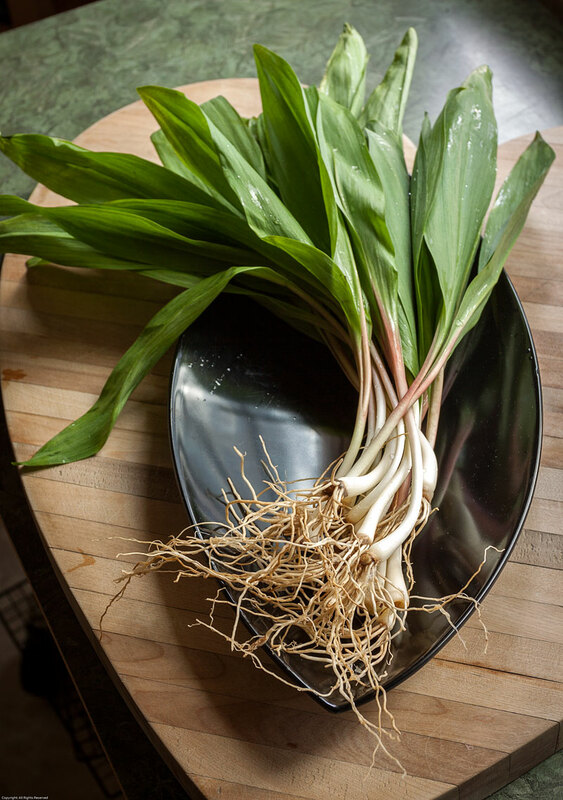 Add the sliced ramp bulbs & stems and cook, stirring frequently, until the ramps are slightly softened, about 5 minutes. Add the arborio rice and continue to cook and stir for another 5 minutes. Stir in the dry white wine and cook, continuing to stir, until it has been absorbed. Ladle in the hot stock, 1/2 cup at a time, stirring constantly. As each ladleful is absorbed, add another, until all the stock has been used or until the rice is cooked through, but still slightly firm to the tooth. Remove from the heat and stir in the pureed ramp/olive oil mixture. Serve immediately, sprinkling a little blue cheese (not too much!) on the top of each portion. Many of the ingredients used in this recipe, and other recipes on the Earthy Delights Blog, can be purchased online at our retail website, Earthy.com. We welcome you to visit the Earthy.com website to view our extensive selection of hard-to-find ingredients and our complete Recipe Collection of over 500 tested recipes. For even more news, information and recipes, sign up for the free Earthy Delights email newsletter.